Quality will always be a main stay at Covington Services, and our rebuilding process is no exception. Here you can see the steps we take on a typical compactor rebuild. We can do as much or as little is needed, based on our customers request. Call or email for an evaluation of your compactor, baler, or container. As you see in the picture to the right this particular compactor is entirely disassembled. Every part is inspected for quality and integrity, and replaced as needed. 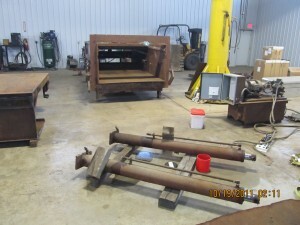 The hydraulic cylinders are even disassembled and rebuilt. Notice the electrical panel of this compactor is empty. It previously had out of date components and will be updated to the most current standards. A vital step to any of our rebuilds. 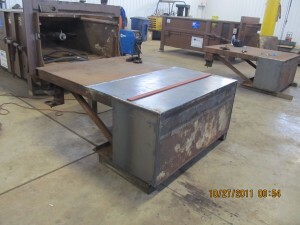 The integrity of all structural and wear item parts are inspected and repaired or replaced as necessary. 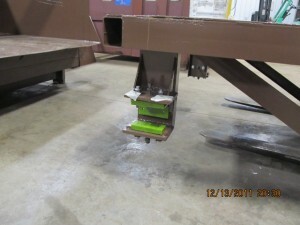 Shown here are compactor rams after being repaired due to wear and abuse that is the norm for the conditions they endure. 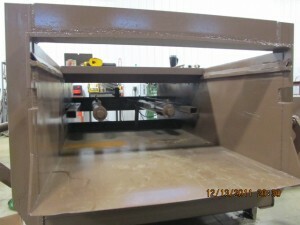 Note: This step would be when we would add your custom fabricated hopper, doghouse, enclosure, walk or drive on decks, hand rails, or anything needed for your application. This is a stand out difference of quality. We sandblast, prime, and paint our rebuilds DISASSEMBLED. This means removing rust and old paint from every part of your machine, and applying new primer and/or paint. Just because it cannot be seen once the machine is in use does not mean it’s not important to its longevity…. in reality its the most important to be protected from the inside out.